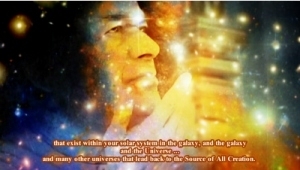 After chanting OM three times, Valerie says, “It is the 2nd of December and we are gathered here in the Name of God and we ask that Cosmic Sai Baba make his presence among us”. ❝I am here. And I am very pleased to be here. As usual I have been waiting for some time – dear ladies seem to like to talk – but that is alright – I have encouraged that before and I still do. I joke with you of course. There is a saying that “women talk too much“, but I do not agree with this. I am male (if you like) … I present myself at this moment as male – but actually I am androgynous – which could be either male or female. And when you raise into the Angelic Realms – this is how it is. It could be one or the other … For both need to come together to find real balance. There was talk of a pope, who had an assistant – as you would say, like a housewife – and that was needed for the energies to meld and become strong … So, what I am saying is that the female energy is very strong. And it is needed very much, to be heard upon this planet. It is not listened to enough … by the men. Maybe from fear … fear is the thing that will take over – and this is not so … for women in their energy of female are nurturers – they are carers – they do not want to take over – they only want to look after. But they feel strongly about some things … because they have a sense of protection in them – particularly towards children … and they can be very, very strong if they feel that their children are coming under danger. That is where the power is coming from – and that is perhaps what makes many males feel little threatened. But they need not feel threatened at all. There is just a need to talk and to listen to each other, so that understanding can take place. Once real understanding takes place then the interaction can take place … and at, shall we say political levels and world leadership … men and women can discuss things with great care and insight … coming from different points of view … but both is needed so that Peace can reign upon this planet. And this is what we are recommending … that more women are listened to and elected into positions of power so that they can – shall we say – give of their intelligence and their way of thinking and their way of solving problems. … It is most important. Most women do not want to run and create a war. And this is what is needed – this is what needs to be listened to. … … They only want to protect – and this needs to be also listened to. They only want to care with love and affection – and this needs to be listened to also. For all these things can be adapted to the most highest political decisions for the Earth … and the Earth will then ‘tune into’ the energy of LOVE AND COMPASSION and that of PEACE. I am sounding like I might be creating a war myself, talking about the differences between male and female … which will go on and then be discussed. This I hope will happen. For as I have said, discussion is needed at all levels. Understanding is needed – at all levels. … … For understanding is only from one point of view if expressed, but, if listened to from another point of expressing – then an understanding can be received as to how they are thinking and feeling – this is important. This is what it is about – understanding from all points of view. I do not intend to go on talking … for this is accused of women … and now as male … I may be be sounding this way also. I joke here … It is really one of communication – so there should never be a judgement of too much talking – for communication helps to bring understanding. And from there, Love and Compassion can evolve. I want to thank those that have sent me the letters … … Know that I have received them and read them; and also I send my blessings. I thank you my children, I thank you, for allowing me to come to speak.